She certainly has her hands full running around after her six children, juggling her own film career with that of her partner’s, and travelling the world for her humanitarian work. But despite her hectic lifestyle Angelina Jolie has revealed she could well fall pregnant with another child. The Land Of Blood and Honey director also spoke out about how her children like it when she and Brad are affectionate together. The couple’s children, Maddox, 10, Pax, eight, Zahara, six, Shiloh, six, and Knox and Vivienne both three, would like their parents to get married, although perhaps not for the right reasons. In the interview the actress also confesses that there is one thing missing from her life – she doesn’t have any female friends. ‘It was nice for me to play with other girls; I don’t really have girlfriends in movies, if you’ve noticed, ‘ she said. The actress, director and mother-of six, who looks stunning in a blue top and gold statement ring on the cover of the U.S. magazine, has previously bemoaned the fact that she really only chats with her partner, Brad Pitt. Angelina’s reputation as the ultimate man-eater and husband-stealer may account for her lack of gal pals. She famously fell for Brad when he was still married to Jennifer Aniston and her second husband Billy Bob Thornton broke off his engagement to Laura Dern to elope with his Pushing Tin co-star. One of the few close female friends that is not deterred by Angelina’s reputation is singer Gwen Stefani. Earlier this year the A-listers were spied with Gwen Stefani getting together at Gwen’s home in London for a fun-filled playdate . ‘All of the kids are very close in age. They’ve attended each other’s birthday parties and gotten together several times at each other’s homes,’ a source to Yahoo news at the time. The pair have been friends since 1998. ‘Somehow Gwen and I keep ending up pregnant at the exact same time,’ Jolie has explained. Best known for action films such as Lara Croft: Tomb Raider, Mr. & Mrs. Smith and Wanted, Angelina also reveals that she may want to move on from acting. ‘I woke up one day realizing, God, I’m an actor,’ she said, ‘I don’t think I intended to be an actor. I think my mother wanted it for me. 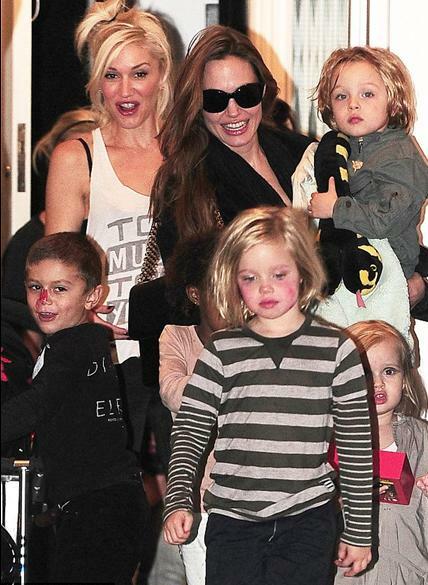 And Angelina credits Brad with helping her juggle her career with raising children. She also opened up about her daughter Vivienne being a ‘girly girl’, divulging; ‘She is so elegant and delicate. Vivi will pick flowers from the garden and put them in her hair. ‘Knox’ she says however, ‘is very much a dude. Very physical, tough. He loves dinosaurs and swords. She also gushed about her happiness saying: ‘Brad has expanded my life in ways I never imagined. We built a family. He is not just the love of my life, he is my family. I hold that very dear. ‘Some of the very darkest sections of the film were conceived in Shiloh’s art class; I was in the back waiting for the kids to finish,’ she added darkly. The Hollywood star has also revealed she plans to do another war film focusing on Afghanistan, where she made humanitarian trips to recently. In the Land of Blood and Honey is is scheduled to be released in the United States on December 23.